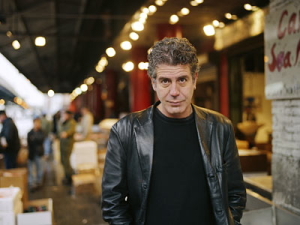 The premise of the series showcases Bourdain as he's killing time until his next flight by exploring various cities. He'll investigate local eateries and cultural staples that would be more preferable than just sitting around and waiting in the airport. One of the biggest reasons Bourdain wanted to do a show like this is because he found No Reservations too inaccessible. "Many of the meals are, frankly, impossible to duplicate," he admitted. "Unlike No Rez, you will actually be able to do the stuff covered on the show." So what cities are on Bourdain's agenda? So far, New York City is speculated as a stop-over, since Bourdain was recently seen filming at two of NYC's local favorites: Eddie Huang's BaoHaus Taiwanese street-food restaurant, and the Big Gay Ice Cream Truck, a soft-serve food truck that pairs traditional flavors with gourmet toppings (like wasabi pea dust and dulce de leche). Currently, 24-Hour Layovers is being produced by the same company as No Reservations, Zero Point Zero. The show will premiere in the fall of 2011.